We've reached the sixth installment of the Tru Bru Bear Club. It's been a great journey so far. Once again this month's pack has had all the extra's added, so it's a monster 13 beer pack. 2 of those are cans and we follow up the first bottle ever sold at Tru Bru with a second, Bach Brewing's Pacific IPA. There was only one place I could ever start this month's Bear Club; BrewDog's Punk IPA. This beer has previously beer the subject of a Great Bottle vs Can Debate, read here. It's one of my favourite beers yet I think this might have been the first time I've had it on tap. It was everything I was hoping for! The hops are fresh, the malts are there but very much in the background; it was simply awesome! Second cab off the ranks was the new IPL from Brookes; Das Unterseeboot. IPL stands for India Pale Lager and although it's not officially recognised as a style yet I'm happy to call it that. This beer is bitingly bitter with a predominantly passionfruit hop flavour covering any signs of the 8% ABV. 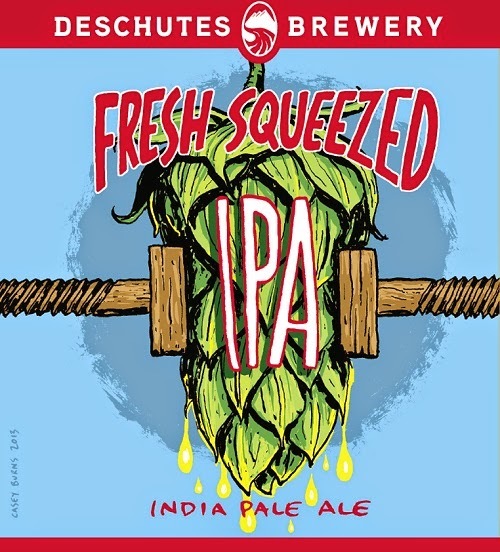 Deschutes is a brewery whose beers I've reviewed a few times in the past. This Fresh Squeezed IPA was a really impressive drop, with pine and tropical fruit flavours, particularly grapefruit, being the most dominant. It wasn't hugely bitter and there was a good background of caramel malts. Zenith IPA from Hargreaves Hill was the next beer I cracked into. Like everything I've had from Hargeaves Hill recently it was excellent. This IPA is not one for the faint off heart, it was brilliantly bitter! I think it's their relatively plain labelling which puts be off buying more of their stuff - I really should remember to buy their stuff! The first of the two offerings from Hot Water that I sampled in this month's Bear Club was About Time IPA. It was a nice balanced IPA with sweet malts definitely holding their own against the usual barrage of hops that this style so often provides. I would recommend it for those pale ale drinkers who can't quite make the jump to IPA because of the bitterness. 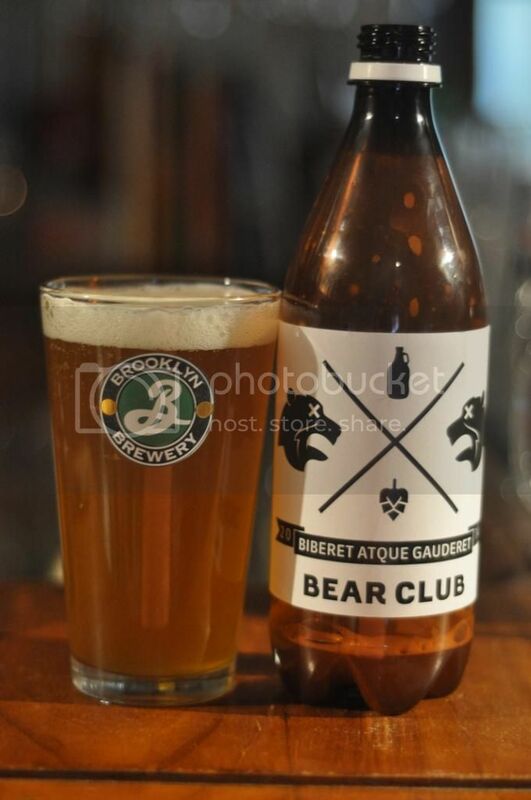 Another brewery who can seemingly do no wrong offered up their Oatmeal Pale Ale to the Bear Club. That brewery is Mornington and I have nothing but good things to say about them! The Oatmeal Pale Ale was different to what I expected; with the base being quite spicy. I enjoyed the hop bite, which was flavoursome but not too bitter. I have to say that the Fish and Chips suggested food match went down a treat! Just like their fellow countrymen at Hot Water, Bach Brewing have two beers in this month's Bear Club. Bach's Dusk Rider is a Red IPA, which much like IPL is still not a recognised beer style. This aside it's a beer that I really enjoyed with the maltiness of an Amber Ale in perfect balance with the citrus and piney hops. Quite malty things often don't do it for me, but this was very good. In a pack with as many IPA's as this one their was bound to be one that was a bit of a let down. That beer came from the US's Left Coast Brewing. The beer was their flagship; Hop Juice IPA. Whilst the hops were assertively bitter and had good spiciness and resinous flavours, there was too much raw alcohol which ruined it for me. Hot Water's second canned offering in this months Bear Club was their Barley Wine. As mentioned previously this is a style that I'm slowly getting into. This one was very much up my alley. It was quite sweet and although it had some raw alcohol it was quite smooth. I think I'm finally beginning to understand this beer style. We continue in New Zealand with Bach's Kingtide. It's been termed a Pacific IPA and is Bach's second beer in this Bear Club. 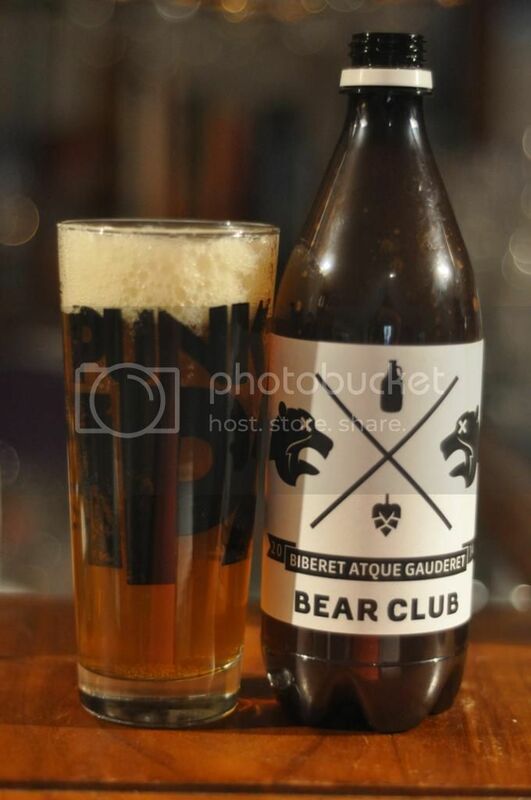 Unlike most Bear Club offerings this one comes in a bottle from the brewery. 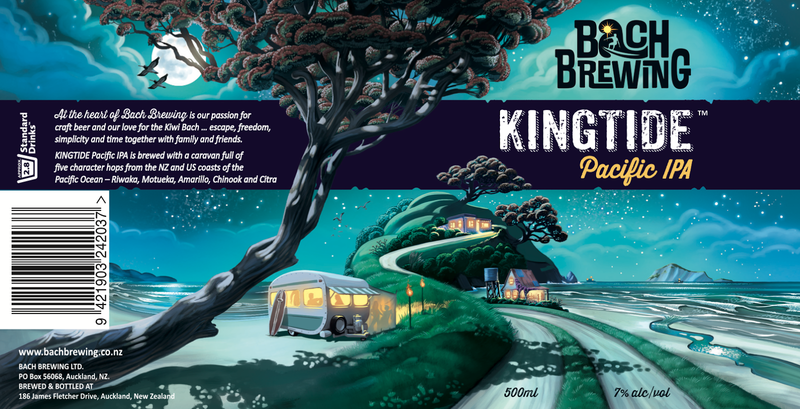 The label is really cool (and pictured above, click to enlarge it) and the beer isn't half bad either. The flavour is predominantly fruity, with some citrus and also some earthy malts coming through as the beer warmed a little. Brooklyn's Weizenhammer was next up. It's a beer that I was very impressed with, and one that I've already discussed in the Untappd Badge review the other day. As I said then, the Weizenhammer, really is just a higher ABV Hefeweizen with banana, bubblegum and cloves all being key elements of the taste. It really is a nice example of a style we see very little of here in Australia. Mikkeller is one of my favourite brewers. He makes some seriously interesting beers and his bar in Copenhagen is one of my favourites. Koppi IPA is the beer we were offered up and I have to say it's one I was not looking forward to. I've had it in bottle form before and found the coffee too over powering. The tap version was similarly odd. I know people who love this beer, but the citrus and coffee mix just doesn't work for me. It seems to happen every month but I do (unintentionally) tend to leave the stouts for last. It would seem this month that I've left the best for last! 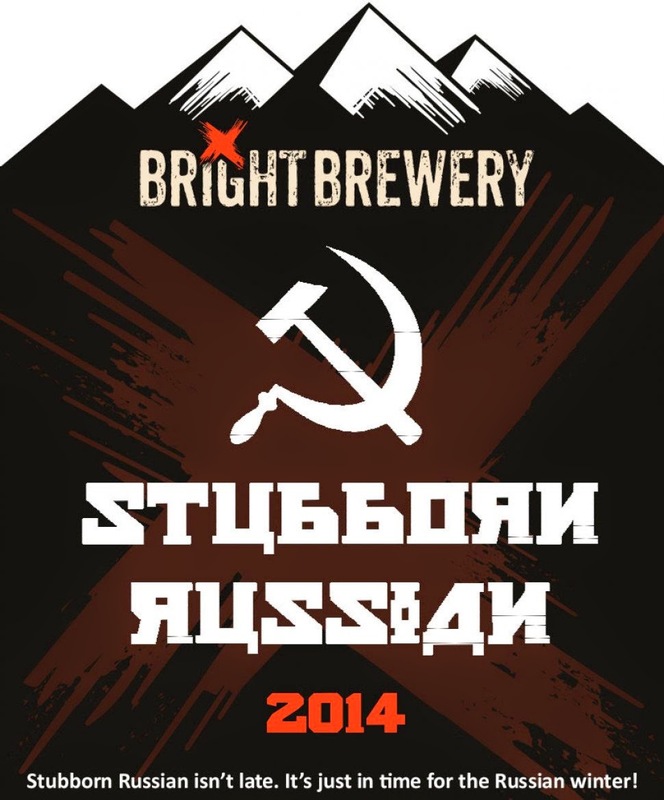 Bright Brewery's Stubborn Russian Imperial Stout is a fantastic stout, with this year's being exceptionally so! There's plenty of roast, a nice woody character and hints of coffee & hops. It doesn't have the thickness that sometimes puts me off stouts in this ABV range, it's dangerously drinkable at 8.9%. Normally here I speculate on what I think might be in the next pack - however I already know what's in it! I'll keep it to myself for now but there is a beer from my favourite New South Wales brewery in there as well as some top drops from overseas! It's got a very summery feel to it and I can't wait to crack into some of the beers in it. I'm also going to make a point that I don't leave the stouts til last! There's still time to get into the club before this month's pack - drop the store a line and let them know I sent you.